"The most important thing I look for in a musician is whether he knows how to listen". Original recording format DXD 352kHz. All other formats are converted versions of the original. Acknowledging your heroes is common in the jazz world. In our new DXD live in the studio series we have asked a select group of European top musicians to recreate one of their favorite albums in their own image. 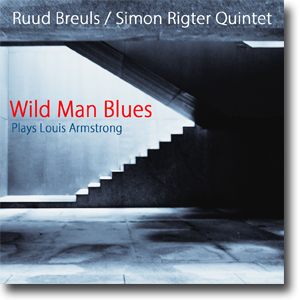 Ruud Breuls chose Louis Armstrong’s Greatest hits. The reason being; "No Louis, No Me" like Dizzy Gillespie used to say. Louis Armstrong was the true father of modern jazz. His influence on the music is still present. Jazz musicians of all generations still hold him in the highest esteem. The only problem was that it was not the musicians themself but the music critics and the music fans who were fighting it. Musicians has always collaborated across styles and genres as much then as now. Armstrong recorded with Ellington. Ellington recorded with Coltrane and as a more recent example; Eric Clapton with Wynton Marsalis. Just to name a few. Musicians respect anyone who CAN PLAY. The style they play in is just a matter of preferences. Ruud Breuls, Simon Rigter, Karel Boehlee, Jos Machtel and Marcel Serierse can play. No doubt. They belong to the absolute top of European jazz. They have played with everybody who is somebody in the world of jazz. But what really makes this album special is the love and dedication they bring to Armstrong's music. Listening to the 8 compositions presented here one realise that genre is completely irrelevant. The Concert Ruud Breuls/Simon Rigter Quintet gave on a Sunday afternoon was completely sold out. It marked the return to the MCO building for Ruud Breuls, who for years have played solo trumpet in the Metropole Orchestra before moving on to the WDR Big Band. The band started the concert with 'On the Sunny Side of the Street'. All the major singers recorded the song; Billie Holiday, Dinah Washington, Ella Fitzgerald, Judy Garland, Nat King Cole...to name a few. But it is Armstrong's version that one seems to remember. Probably because the song is so befitting Armstrong’s character, his joy of life, the eternal optimist. The Quintet plays the song with a light playfulness, strolling along on that first glorious day of spring. 'Basin Street Blues' was recorded for the first time by Armstrong in 1928. The lyrics were written much later by Glenn Miller and Jack Teagarden. This version is played with a touch of sadness. You could say the quintet brings the blues back to the composition. Basin Street was not an entirely happy place, it was the main street in the red light district of New Orleans. 'Wild Man Blues', recorded for the first time in 1927, is supposedly written by Jelly Roll Morton and Louis Armstrong. Louis says he never could figure how; "First time I talked to Jelly Roll was in 1936....." :) Here the tune starts and ends with a good old fashioned 2nd line New Orleans groove but manage to reflect on the whole history of jazz during it’s 7 minute duration. 'St Louis Blues' goes all the way back to 1892, when the songs composer WC. Handy heard the call and response line that inspired the melody for the first time. But this fabulous arrangement is pure ‘60 jazz. It could be a lost track from Miles Davis’ ESP sessions. Check out Jos Machtel quoting Ron Carter’s bassline from the composition Eighty-One. 'Big Butter And Egg Man' was written for Louis Armstrong and singer May Alix. Earl Hines recalls that beautiful Alix would be flirtin’ with the young Armstrong when performing the song, causing Armstrong to forget the lyrics and just stare at Alix, and the concerned band members would shout "Hold it, Louis! Hold it." Here the song has been given a hard bop twist, slightly modernized, but the fat swing the song is treated with is all Butter and Eggs. 'Sleepy Time Down South' (When It's Sleepy Time Down South) is Louis Armstrong’s signature song. He recorded it a great number of times. Ruud Breuls, Simon Rigter, Karel Boehlee, Jos Machtel and Marcel Serierse are mature musicians, with nothing to prove, willing to let the music speak. All 4 improvisations on 'Sleepy Time Down South', are keeping up with the mood of the song. Each note filled with emotion. 'Struttin’ With Some Barbecue' is NOT about food.... According to Cab Calloway’s Jive Dictionary "barbecue" is slang for a pretty woman. Here the quintet plays the song with pure second line New Orleans joy. The band swings so hard, that I envision them being the band leading the mourners returning from the graveyard, New Orleans funeral style, after having laid Louis’ body to rest. Ruud Breuls and Simon Rigter have a long history of playing together. Their report and empathy is remarkable. Listen how they share the melody on Louis last big hit 'What a Wonderful World', each adding small embellishments to this melancholic celebration of life. Listen how they at times blend in perfect harmony, but still retain their own individual phrasing. True mastery. The 8 pieces of music were performed live in the studio in front of an audience of 80 people. The musicians were placed in front of a stereo pair of microphones with additional spot microphones on each instrument. The musicians were playing without headphones, the reason being that we believe that when we get the musicians to play together in the same room, without headphones, it creates a number of musical and technical benefits: As they are not 'separate' by the headphones, the musicians, in order to hear each other are forced to create a natural and musical balance, a balance which is then easily captured by the main stereo pair of microphones. Because of this natural and musical balance the need for compression to control levels is no longer necessary. Since everybody is in the same room, the boxed sound which is so common in many modern recordings is absent as the sound of the room helps 'glue' the sound of the recording. The recording took place in the now legendary Studio 2, situated in the the building of the Dutch Music Centre of Broadcasters (MCO). It is the oldest recording studio in the Netherlands and has hosted a wealth of prominent artists; Django Reinhardt, was there in 1937, Jazz at the Philharmonic featuring Ella Fitzgerald in 1953, and in the 1960’ Wes Montgomery, Clark Terry and Eric Dolphy all recorded in the studio. All power cables, interlinks and power conditioners by AudioQuest.